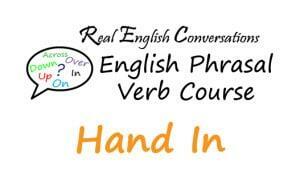 Learn the meaning of English phrasal verb: Hand In. This phrasal verb means to submit something like an assignment. The teacher told his students they had to hand in the assignment first thing tomorrow. The teacher told his students they had to submit the assignment first thing tomorrow. I think it’s a good idea to hand in your resume to as many people as you can if you want to get a job. I think it’s a good idea to submit your resume to as many people as you can if you want to get a job. Assignments that are not handed in on time will not be accepted. Assignments that are not submitted on time will not be accepted.